Barbara Karant, nationally recognized for her architectural and interiors photography, has expanded her artistic repertoire over the last 10 years to include capturing the magical personalities of canines. With multiple fine arts degrees and work in many museums, Barbara uses the discerning eye she developed shooting for famous architects to uniquely document the graphic lines and vibrant personalities of the dogs she shoots. The divergence of direction in her work happened quite accidentally after she adopted her first greyhound Easton and became committed to helping Greyhounds Only, an Illinois adoption and rescue group. 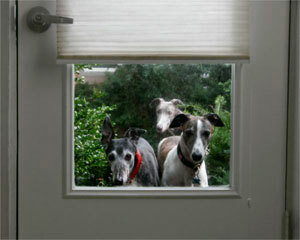 Barbara is the author and photographer of two books, Greyhounds, and coming in spring 2010, Small Dog Big Dog. Due to the demand of pet guardians who have admired her books, Barbara launched Karant Canines so you can now have her capture your very own precious companion. Contact Karant Canines to set up a portrait sitting for your favorite four-legged friend. Barbara is also available for agency ad campaigns and has a vast file of dog images obtainable for exhibition or stock usage. Call or email Barbara today. She looks forward to creating a visual memory of your dog (or other pet) for your own personal collection.